Canon has announced a host of new printers and scanners today for various different home and office uses. For photographers, a few of these in particular will be of interest. One is the Canon PIXMA TS8250 Series, an all-in-one A4 printer that produces high-quality photos with six individual inks, capable of pumping out 15 images per minute. Canon says it’ll be able to print a 4x6 borderless photograph "in a matter of seconds," and it can be wirelessly connected to iOS and Android devices via the Canon PRINT app. If you have an Alexa-enabled device, this can also be used to control the printer. Elsewhere on the printer you’ve got a 10.8cm touchscreen, a two-way paper feed and optional XL and XXL cartridges to help keep costs down. Another photo-friendly printer in the lineup is the Canon PIXMA TS6250 Series, a compact, connected model that can also fire out borderless photo prints at an impressive clip, printing up to A4 in size. It has a 7.4cm touchscreen and uses five individual inks, and, like the above model, can also be connected to the cloud via the PIXMA Cloud Link technology. Of course, if you like your images a little larger, there’s always the A3-printing Canon PIXMA TS9550 Series, a connected printer that delivers A3 prints with an A4 footprint. It uses five individual inks to promise photos with a 100-year album life. 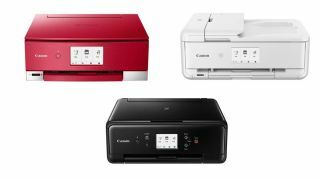 Also announced today were the cheap, compact all-in-one Canon PIXMA MG3650S Series and the multi-functional office printer Canon PIXMA TR4550 Series. Canon has also unveiled a pair of new scanners. The first is the Canon CanoScan LiDE 400, a flatbed scanner able to scan up to 4800x4800 dots per inch (dpi) to precisely reproduce high-resolution photos. For a more lightweight option there’s also Canon CanoScan LiDE 300, which can scan up to 2,400x4,800 dpi – more than adequate for documents. All of the printers will be available from September 2018 except for the PIXMA TS9550 (the A3 model), which will be available from November 2018. See Canon’s website for more information.